When you buy fresh vegetables, one of the first steps you may take is to wash them. While this may come down to habit or the prompting of your mother or loved one, very real reasons exist for why you should wash your vegetables before eating them. Washing your vegetables is an extra measure that prevents food-borne illnesses, including those caused by bacteria such as Salmonella, Listeria and E. coli. In addition, washing vegetables can eliminate any residue left by harmful pesticides. When vegetables are grown in the ground, such as potatoes, they are at increased risk for coming in contact with contaminants that can commonly live in the soil. Vegetables also can become contaminated in their various production phases before arriving at your local grocery store. From preparation to storage time, there are opportunities for contaminants, especially bacteria, to live on your vegetables. However, because the kinds of pesticides used are strictly monitored, as well as the amount of pesticide residue left on fruits and vegetables, the risk of getting ill from pesticides on produce is low, reports the California Department of Pesticide Regulation -- especially if you wash your produce before eating. Because organically grown produce does not involve using pesticides or growth hormones, you may believe you do not have to wash these vegetables. However, even organically grown vegetables can have contaminants from the soil. For this reason, according to the FDA, you should always wash any vegetables regardless of their source -- including organically grown produce and produce purchased from a farmer's market. You should wash vegetables prior to cutting them. If your vegetables have tough skins -- like potatoes or bell peppers -- you can wash them under running water and use a scrub brush to remove contaminants. Softer-skinned vegetables like tomatoes can be washed under cool running water while you rub the skin to manually remove bacteria. Drying them carefully also can remove extra bacteria. 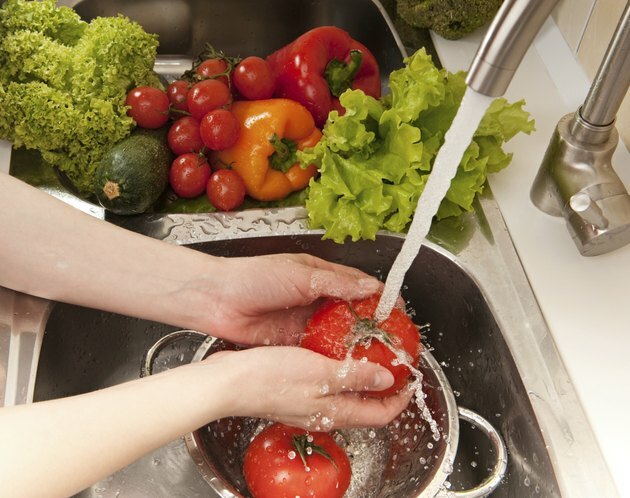 Always wash your hands after washing vegetables, but don't use soaps or detergents on your vegetables. These are often are not made for consumption and can make you ill. You can, however, purchase special fruit and vegetable washes that do remove bacteria and are okay to eat. While thoroughly washing and drying can help to reduce risk of contracting a food-borne illness, some uncooked vegetables carry a risk regardless of washing them. This includes raw sprouts, which require warm environments that harbor bacteria like salmonella and E. coli. Rinsing sprouts before serving will not reduce these bacteria types. In this instance, you should always cook sprouts to kill bacteria. In addition, washing is not a foolproof method for bacteria removal. It is still possible that eating raw vegetables can make you ill.
Should You Soak Raw Fresh Vegetables in Water?